Ancient peoples had the benefit of dark skies and experienced the full spectacle of the starry heavens. The Moon gave light at night and would have been particularly useful in the two weeks centred on full Moon. The regular monthly cycle of lunar phases provided a convenient measure of time, upon which many ancient calendars were based. Stonehenge has become the very icon of ancient astronomy, featuring in nearly every discussion on the subject. study of beliefs and practices concerning the sky in the past and the uses to which people’s knowledge of the skies were put. 2017 Lunar / Moon phases. Astro Moon Calendar shows phases of the Moon each day, astronomical events and astrological forecast for the year. 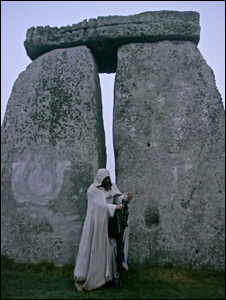 Stonehenge Full Moon Guided Walking Tours. Explore the landscape with a local historian and astronomer. Follow us on Twitter and Facebook for daily Stonehenge sunset / sunrise / moonrise / moonset times. Reblogged this on Stonehenge Guided Trips. The ancestors of the people who built Stonehenge travelled west across the Mediterranean before reaching Britain. Hundreds of pagans and druids descend on Stonehenge to celebrate the 2019 Spring (Vernal) Equinox. We aim to make this the ultimate source of the latest Stonehenge news available on the web. This blog is updated almost daily and promises to deliver accurate 'up to date' information on new theories, new digs, solstice events, Druid gatherings, the new visitor centre, general megalithic links and some fun along the way. We welcome your input.... "There is so much misinformation about Stonehenge on the web, so it’s really refreshing to see such a clear and lucid presentation, what you have here looks like best general overview of Stonehenge to date, well done!" Mystery surrounds this 5,000 year old monument in the centre of the World Heritage Site. Visit this prehistoric South West site near Salisbury in Wiltshire, and decide for yourself whether Stonehenge was a place of sun worship, a healing sanctuary, a sacred burial site, or something different altogether!